We’ve gone over many ways to do a Facebook search, but in this last installment there’s a bit more to discover in order to complete your Facebook search training. In part one we covered how to search Facebook by a phone number, doing a typical people search in order to find friends, completing a Facebook search by hashtag and searching by post. In part two we covered how to do a Facebook search without logging in and we talked about the advanced search feature that is now known as Facebook graph search. 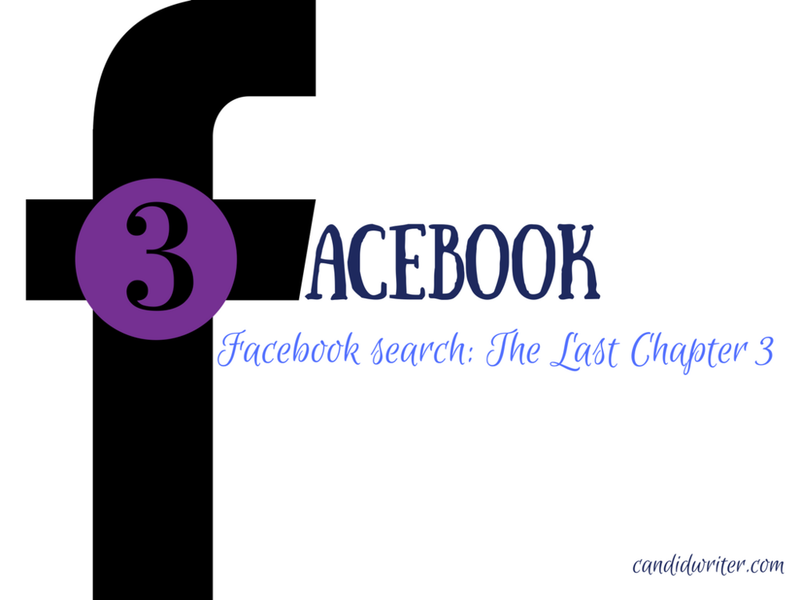 Needless to say there’s been a lot that I’ve disclosed on how to search Facebook with a fine tooth comb and as hard as it may be to believe.. there’s even more to tell you about in this post too. The first method is learning how to search Facebook groups. Using the graph search that we talked about in the last post, the idea here is that you want to find people that are connected to the niche that you’re looking for. 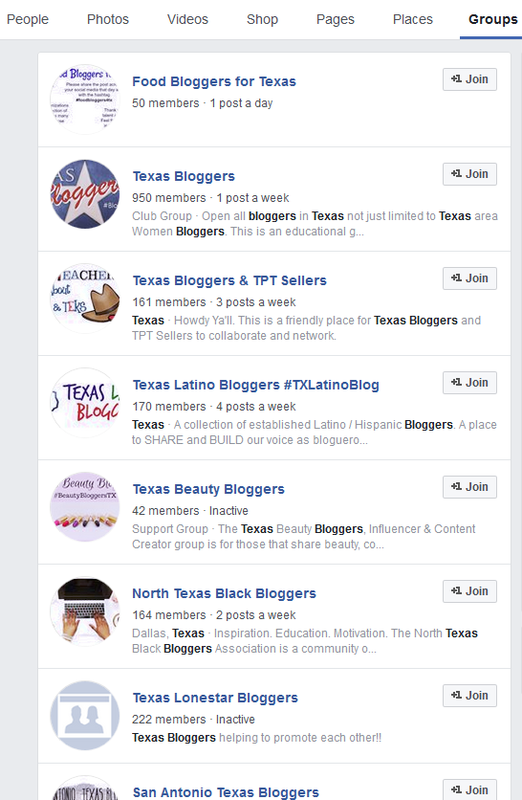 For instance if I wanted to look for other bloggers, what would I search for ? In the graph search I would type in a general search term. I’m going to type in “bloggers”. No quotes needed for the search. Now after typing it in, we’ll wait and see what the search function brings back in terms of results for me. As you can see in the image, I’ve typed in bloggers and there are several results even though you can only see the first five that were generated. 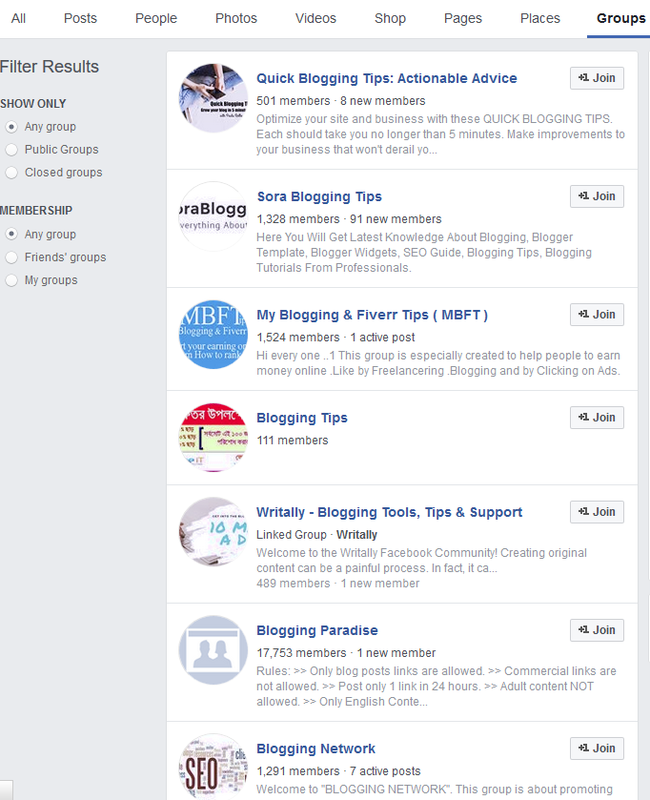 Additionally, you’ll notice that I have navigated to the “groups” tab to show what groups are there that are associated with that keyword that I have used for the search. You can also further modify this search by indicating whether you want to see only the public groups or the closed groups too using the panel to the left of the search page. Nevertheless, the really nice thing about this is that it helps us to figure out where people are hanging out that are connected to the niche that we want to target and focus on. Now for me as a blogger, to find other bloggers, aspiring bloggers or people that like to follow other bloggers, this would be a very targeted way for me to locate individuals connected to this niche. Granted “bloggers” is very broad, but you get the point as to where I’m going with this. Even if you want to narrow down your search the end reality is still the same in terms of what this search can do for you either from an informational standpoint or if you’re trying to find people that may be interested in a product or service that you’re trying to sell. In order to search Facebook photos, we’ll continue to use the Facebook graph search. As with other searches that we have done in this Facebook series, let’s start with a keyword. I did a post on motivational quotes to help inspire and elevate bloggers when they feel like quitting or giving up so for the purposes of this search we’re going to use this keyword phrase, “motivational quotes for work”. Once we complete this search, the tab that we want to navigate to is going to be the photos tab. As you can see in the image below, the photos are a byproduct of the successful completion of the search and this search can be done for any photos that you’re seeking connected to your niche. Some may say that you need to search starting with the keyword: photos, but I would disagree. Granted the search that I did was on motivational quotes, but you can do a search within any niche + the keyword phrase to generate any “public photos” associated with that search. The next and final search that we’ll do is going to target finding people by location. While location might not be the biggest thing since sliced bread, what I can tell you is that it’s not just a basic location search. In the example that I will show you as illustrated in the photo, you’ll see that I targeted 2 different search criteria while searching by location. The criteria that I targeted was hometown and college attended. 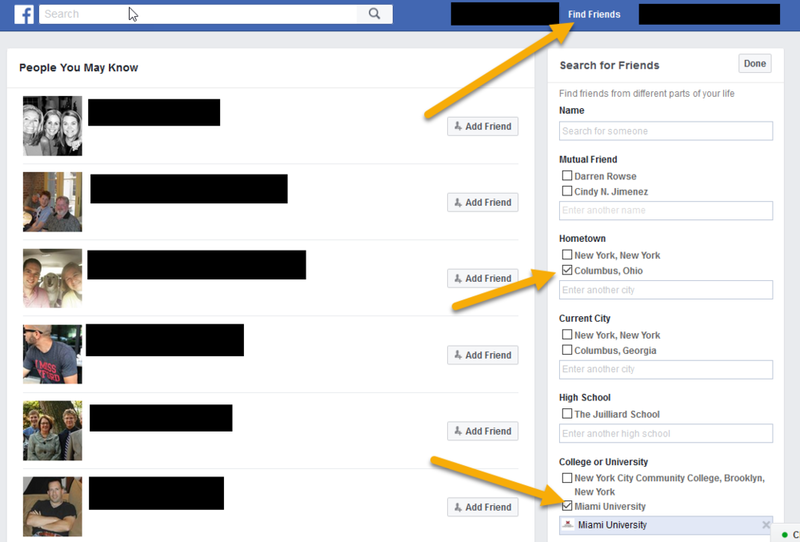 This search was also completed by the “find friends” option at the top of your Facebook search dashboard. All of these are self-explanatory, but again as I mentioned before you can search these location type criteria simultaneously and you’re not just limited to only choosing one and proceeding with your search. In the image below you’ll see that I’ve chosen two criteria. I’ve done this randomly just to show you for the sake of demonstration what the search would generate. I chose a hometown city of Columbus, Ohio and a College as Miami University because I wanted to see what the results would be for individuals who grew up in that city but attended Miami U.
Facebook generated several results which was a great representation of the power of that search. With that said, there are many more options that can be chosen to help you narrow and fine tune your search even further beyond a location that you can combine with other aspects of this type of search. Imagine that you’re doing work on behalf of a local business to help them find leads. Search with this capability may be very helpful in providing such a service and this is just one of many possibilities that may be at your disposal through Facebook search. Needless to say, as this is the third and final installment of the Facebook search series, surely you’ll be able to find any information that you need for blogging, for business or personal use using the methods that have been disclosed in the series of posts on this topic. Additionally, before I end this post you may also want to try Search Is Back as an alternative to expediting your Facebook search as well. Facebook search is a topic that gets its fair share of attention. Considering the well-known fact that it’s among the largest websites in the world, it should come as no surprise that “Facebook search” is a big deal. Are you a Facebook user ? Well then on the topic of search, how well do you navigate and search their massive user database ? If you’re an expert, I’d love to see your thoughts and comments below because there’s a lot to be said about Facebook search. With that said, there’s everything from very basic searches to searches that are more advanced. This is a big deal for the casual user to the advanced to those that need and want to understand how to navigate search for business purposes as well. It’s fair to say that “search” affects everyone on FB. No matter where you are in terms of your comfort level or Facebook usage level, the bottom line is that you need search to work and fulfill it’s purpose in helping you to locate the information that you’re looking for. When you consider the core purpose of what people come to do when they log in to Facebook, search is used but in it’s most rudimentary form by many of their users. However, there’s so much more to search than what can be done, achieved and found at it’s most basic level on the FB platform. With that said, let’s talk about what you can do with Facebook’s search feature. Did you realize that you can search using someone’s phone number ? Well it can certainly be done, but only if the user has “not” opted to keep their number private. Nevertheless, if the person or business etc. has decided that they don’t care about having their number public on Facebook, then that number is seen as searchable information and can be used to locate an individual, business or otherwise on Facebook. The Facebook people search is considered the most basic of basic searches on FB. Once you’ve logged into your account, just click the friends or find friends button on the top bar in your dashboard. If you’re new to FB (yes folks, new Facebook users (aka newbies) do exist) whether this is for a personal account or business account you’ll notice that there’s a: people you may know section, the option to search your contacts section & a more ala cart section (aka - customized search), where you can add other details to narrow your search to find some familiar faces. Options here include searching by name, town, city, school (high school, college/university or graduate school) and even the ability to search by their employer if you have that information. With that said, here's a related video on finding people on Facebook. Using the hashtag on Facebook is pretty straightforward and works in the same way that it does on nearly every other social media platform. Of course, while there are the same benefits to using hashtags on Facebook, there are also the same pitfalls as well so always stick to best practices when you choose to use hashtags in your Facebook engagement. Using too many hashtags will get you labeled as a spammer and quite frankly, too many of those annoying little (#) signs is akin to banner blindness. No one is going to pay any attention to you and while even I can get a little hashtag crazy from time to time, you’re better off sticking to 1 to 3 and even that could be a stretch. Two hashtags might just be the perfect number indeed for any thought you have online that you want to share on a social media platform. With that said, always use the hashtag accompanied by a “single word”. You’ll find that clicking on a hashtag will also show you the list or compilation of posts that are associated with or include that particular hashtag too. Additionally, while using “letters” alone might seem boring with respect to hashtags, you can use numbers as well, but forget about getting fancy with other special characters. If you use characters like “&” or “$” or anything similar, all that’s going to do is break your hashtag and it won’t work the way it’s supposed to. Searching for posts is pretty straightforward. Just type in the keyword phrases associated with the content that you’re trying to find. In my case as a blogger, a search for “blogging tips” makes sense to perform. The quotation marks aren’t needed necessarily but using them will give you slightly better results. The Facebook post search feature produces relevant information and categorizes it automatically for you which can be helpful if you’re looking to target something specific instead of having to sift through several results. Another little nifty thing you can do with this particular search is to add a name to that search and it will filter your query to include that name. So for instance, if I did a search for “blogging tips” lisa. 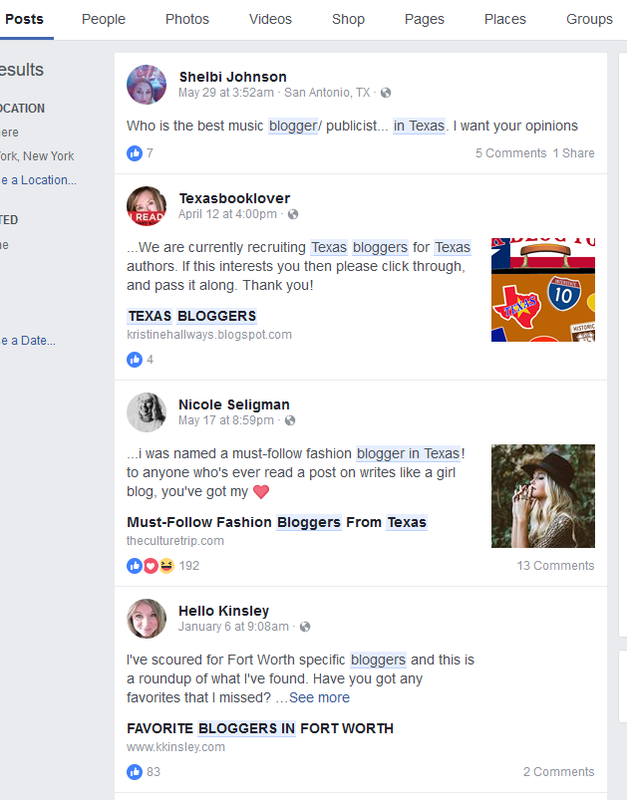 Facebook would provide search results that included both the phrase blogging tips and if there are any Lisa’s associated with that phrase, that should show up in the search results because of the parameters I’ve indicated in the search box. In part 2 of this Facebook search series, we’ll chat about the Facebook advanced search feature and another really curious topic on Facebook search with a great answer on how you can accomplish it. There’s a lot of curiosity about this and I’ll give you some insight into how you can accomplish this with some easy and helpful information. I won’t say anything more about it here so you’ll just have to read the next post to see exactly what it is that I’m talking about. Beyond that, however, there’s no doubt that with Facebook’s staggering user-base.. a practical, effective and user friendly search is absolutely warranted and needed. The jury is still out on whether their search function is a real winner because there’s so many opinions on how good and bad FB’s search feature really is. Nevertheless, you’ve really got to consider that there are people that just want the search function to be as simple as simple gets and others that want a more feature rich product not to mention everyone else in between those two polarizing groups that have their own thoughts on what they want from the Facebook search feature too. 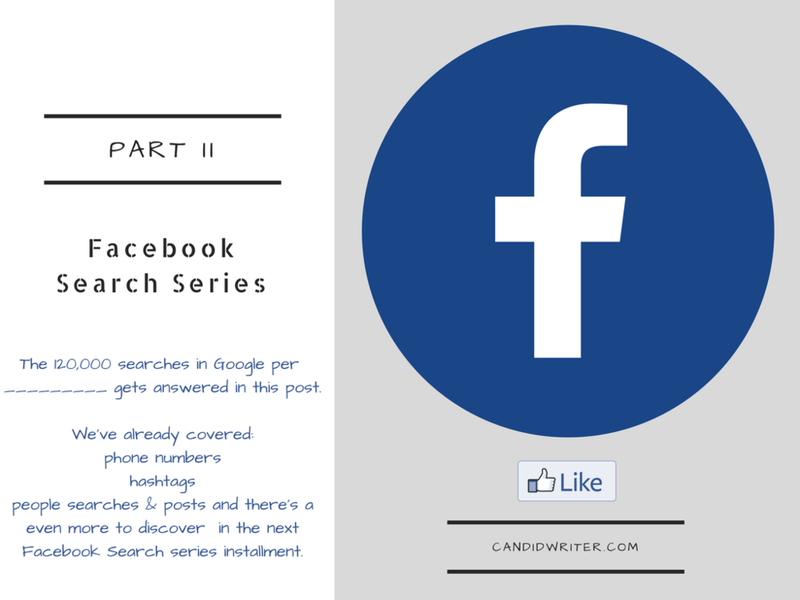 While I’ve touched on the details on how to do a Facebook search by way of a phone number, through hashtags, seeking friends (people search) and searching for posts there’s a lot more to cover in part 2 here: Facebook Search Part 2.